A fabulous mystery game that teaches kids about birds and photography. Don't miss this one! With Snapshot Adventures: Secret of Bird Island, you embark on a journey to discover what happened to your missing grandfather, a famous naturalist and bird photographer. Armed with your grandfather's camera, his half-empty field journal, and a map of his most recent travels, you retrace his steps and meet many of the people he worked with. As you travel to the 50 locations around America, you are asked to take pictures of birds in exchange for information about your grandfather. 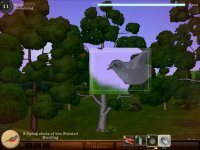 Your cursor becomes your camera viewer as you scroll through the on-screen environments looking for birds. You take a photo by clicking your left mouse-button. Each of your grandfather's cohorts teaches you something new about photographing birds. For example, Colonel Perkins, who is on deadline for the Patriot Post's annual Backyard Birds issue, asks you to take some photographs of the American Robin. When you do, he rewards you with a zoom lens and explains what makes a photograph good. The game uses a point system to grade photos. Your score is based on the size of the bird in the frame, centering, orientation, if there are extra birds in the photo, and whether the bird is doing something like singing, preening, flying, or eating. You lose points for birds that are cropped, obscured, or poorly lit. Your score translates to a 5-star evaluation system that is applied to each photo at the end of your photo shoots. Your photo assignments start off easy with requests of birds in stationary poses; but you quickly graduate into taking photos of flying birds – a task that takes some practice. Earned gadgets can greatly help to accomplish this goal, particularly when you use the one that stops time for a few seconds. Also helpful is the night vision lens, more zoom, and the ability to see through leaves. Snapshot Adventures: Secret of Bird Island is published by iWin and was developed by Large Animal Games (www.largeanimal.com ) in conjunction with the Macaulay Library at the Cornell Lab of Ornithology, the repository of the world's largest bird sound collection. The game features over 100 realistic looking and sounding birds found in 50 different locations, including forests, urban environments, deserts, swamps, oceans, and lakes. This game is loaded with positive features. The characters you meet are entertaining, informative, and weave a good story. Soothing guitar music accompanies the game play and fits in well with the bird songs. The game play requires you to think logically when planning a photo shoot. For example, if it's nighttime, you will need to figure out which equipment allows you to accomplish your goal. And if you take great photos, they end up on magazine covers – a great incentive to do well. Another excellent feature of this game is the user-generated content. After you finish an assignment and review the photos that you have taken, you can choose to send those photos to a friend via email. 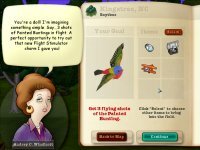 You can also create your own custom bird to release into the "wilds" of the Internet, and download fantasy birds created by others. Snapshot Adventures: Secret of Bird Island is an outstanding game that all family members will enjoy, regardless of whether they are bird-lovers or not. Playing this game will heighten kids' awareness of birds and tune them into the environmental issues that affect their habitats.